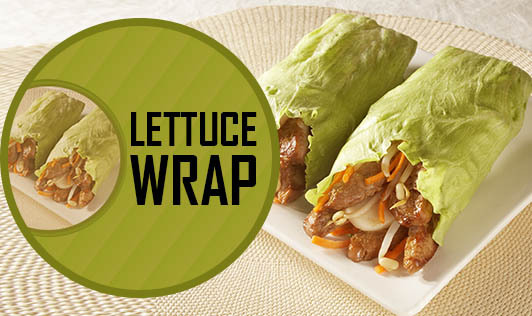 Lettuce wrap is a fiber rich tasty recipe with an added benefit of vitamin-A and vitamin-C along with the benefit of proteins which would be a good choice for the young and old in the family. 1. Heat the oil in a non-stick kadhai, add the garlic, ginger and spring onions and sauté on a medium flame till the onions turn translucent. 2. Add the mushrooms, carrots and cabbage, mix well and sauté on a medium flame for 2 to 3 minutes. 3. Add the bean sprouts, tofu, lemon juice, soya sauce, salt and red chilli flakes and sauté on a medium flame for another minute. Keep aside to cool. 4. Divide the stuffing into 6 equal portions and keep aside. 1. Wash the lettuce leaves, dry them on a towel and keep aside. 2. Place a lettuce leaf on a clean, flat surface and place a portion of the stuffing along one side of the leaf. 3. Add ½ tsp of peanuts and ½ tsp of basil over the stuffing, roll it up gently and secure the roll by inserting a toothpick or tie using a spring onion green. 4. Repeat with the remaining ingredients to make 5 more wraps.